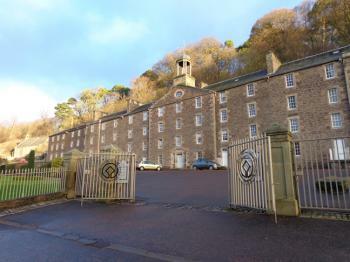 New Lanark is a village founded in 1786 by David Dale, who built cotton mills and housing for the mill workers. Dale built the mills there to take advantage of the water power provided by the River Clyde. 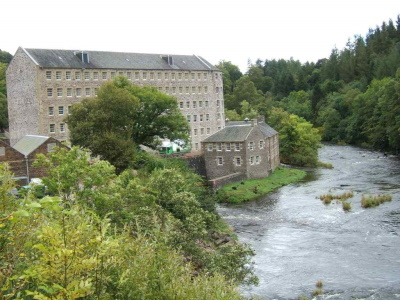 Under the ownership of a partnership that included Dale's son-in-law, Robert Owen, a philanthropist and social reformer, New Lanark became a successful business and an epitome of utopian socialism. 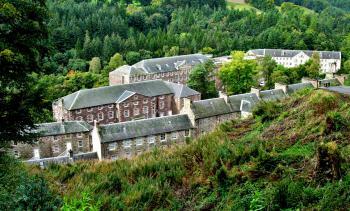 Some 2,500 people lived at New Lanark, many from the poorhouses of Glasgow and Edinburgh. Although not the grimmest of mills by far, Owen found the conditions unsatisfactory and resolved to improve the workers' lot. He paid particular attention to the needs of the 500 or so children living and working at the mills, and opened the first infants' school in Britain in 1816. He also designed and equipped workers' housing and public buildings designed to improve their spiritual as well as their physical needs. On this Sunday morning I took a train from Glasgow to Lanark, a direct connection taking 55 minutes. At the rather desolate Lanark station there was a bus waiting that took me to the New Lanark WHS within a few minutes. Measured by the huge car park, this is a very popular place for summer outings. This site's greatest asset is its really lovely setting, near the river that supplied the necessary power for making the mills work. A good place to develop into Utopia! The buildings in this tiny village are well restored, and some of the houses even are in use as modern apartments. You can have a look inside in several houses, the mills, the school and a shop. All in all it's a nice place to walk around for an hour or two. On the minus side, I didn't find the exhibitions too great. There's a lot to see and do for children, but not so much for people over 12. Like some of the Derwent Valley Mills (another UK WHS, related to this one and very much alike in atmosphere) some of the buildings are used for uninteresting shops. And why this strange award gallery that you have to pass through? After I visited New Lanark initially I had no desire to write the review since strangely most of my experience on this industrial village was similar to Tsunami’s recent review, while I agreed with most of the review, I think I should write at least something good from my visit to New Lanark. Traveling to see UK’s World Heritage Sites mandatorily made me to visit at least 3 industrial villages, Saltaire, Derwent Valley and New Lanark, and in my opinion all of them are really poor in terms of presentation and managements. I did not have any nice memory to remember on Derwent Valley nor any word to praise on my visit to Saltaire, so I did not expect anything from my visit to New Lanark. And my low expectation kept me to be OK with this place where similar problem I saw in Saltaire and Derwent reoccurred again. But at least I felt the management on New Lanark is slightly better. The lovely location and beautiful natural surroundings also help a lot to make the visit worthwhile. Contrast to Tsunami’s, I found its award-winning ice cream is really good and a must try if you visit this place especially the vanilla one. Its cafeteria was also quite OK if there is no noisy school trip and have shepherd’s pie. 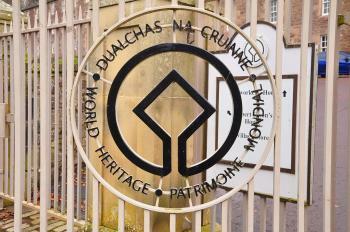 And I think this is the easiest place to see the emblem of UNESCO World Heritage Site that write in Scottish Gaelic - Dualchas na Cruinne. From Edinburgh I stopped at Lanark by train on my way to the Glasgow airport. At the Lanark train / bus station on a Wednesday morning I asked a bus driver if there is a bus to New Lanark, and she suggested that I took a cab. So I just walked to the New Lanark WHS. I have to say I did not particularly like this site, not because I disagree with OUV or because I didn't find anything interesting, but because of some strange atmosphere. Second, I seriously felt that people who worked there were unusually unfriendly, beginning with the lady at the visitor center. I was about the only tourist when I got there at 9.30, and everybody avoided eye contact with me and said nothing to me as I walked around, as if they didn't want to start working that early in the morning. Are they so underpaid? The clerks at the supermarket were also unfriendly; they don't like tourists probably because when the dust settles after tourists leave, they have to clean the dust! Third, after all this I did not even care for the ice cream they claimed they had created in order to fund their projects. It's probably the same ice cream I had at the Derwent Valley Mills WHS anyway! I understand that these industrial heritage sites restored for tourism often have difficulty in determining how to use the space no longer used for its original function. So this site installed several attractions, a huge cafe and even a hostel all for school children, and a supermarket for their teachers / parents. But, unfortunately, I have to say this site looked as though the heart of restoration had gone awry. 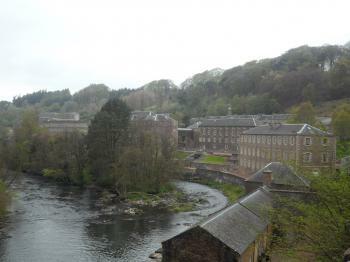 We visited New Lanark on drizzly day in April. I’m not sure if it’s necessarily the best sort of conditions to visit a very grey Scottish mill town, but never mind. 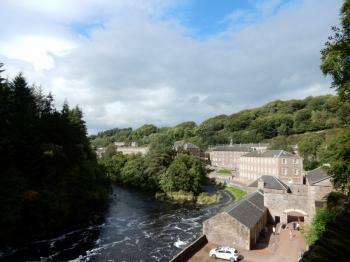 The best view of New Lanark is also normally your first. As you come down the hill from the car park, you are presented with a nice little panoramic view of the entire site. Consisting of four mill buildings, several terraced housing units and a scattering of extra buildings such as a school, engine house and a church, the site is nestles tightly along a bend in the River Clyde, surrounded on all sides by wooded hills. It feels quite intimate, and has peculiarly picturesque quality to it. The visitor centre does a good job in explaining the background of the site. However, the presentation is very modern, and doesn’t feel very in keeping with the setting. Most egregious is the weird tram-like gondolas that take through the story of one of the historical residents. I guess it’s meant for children, but I’m not sure whether they would find it engaging or not. Other slightly dubious choices include a large glass and steel bridge connecting two of the mill buildings, and an out of place (though none the less pleasant) roof garden. The rest of the site is fine. We completed the tour, looked around the fairly standard gift shop, and spent a pleasant few hours doing some of the riverside walks (not technically part of the heritage site, but really helpful to understanding why New Lanark is built where it is). The site feels poorly presented in places, such as the Village School and Village Shop, which are more nostalgic than informative. On the other hand, I found the house of founder Robert Owen, one of the smallest buildings, to be one of the most interesting. It tells the story of his life, and his progressive views (for the time), and how they shaped our view of utopian socialism. Overall, this site was fine. I feel, especially compared to Saltire or the Derwent Valley Mills, it’s one of the stronger industrial heritage sites in the UK, helped in no small part by its setting. It’s a perfectly fine day trip from Glasgow or Edinburgh if you’re visiting. This is really quite an interesting site because of its good state of preservation - you can easily imagine yourself being a millworker (or owner) in the early 19th century. The museum/visitor centre is a bit on the touristy side (telling the sad story of poor Annie McLeod who had to work in the cotton mills at an early age), but all buildings are well-preserved, including the schoohouse and the residence of founder Robert Owen. You learn a lot about his ideas of utopian socialism, worker welfare, and urban planning (including his attempts to recreate a similar site in New Harmony, Indiana). The cotton mills were powered by the River Clyde which runs through the village, and you can walk upstream through a nature reserve to the famous Falls of Clyde. 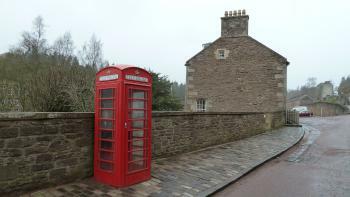 New Lanark is quite easily reachable by bus from the larger town of Lanark, which has direct rail connections to Glasgow. I went to New Lanark expecting to see a mill town similar to those I'd seen in the eastern United States, and I was not disappointed when I visited in fall 2015. Like other historical towns I've toured, this site is very well organized to educate school groups; that is probably fitting, since the education of children is one of the key components of the vision of Robert Owen, the social reformer who founded New Lanark. 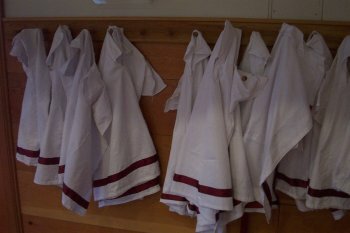 Owen created a society at the mill in which workers had good housing for their families, and their children had education through Britain's first infants' school. Owen hoped that not only would his mill town turn a profit, but that the lives of his workers would improve. Even though I've seen similar towns in the United States, I enjoyed walking through the factory, school, and museums at New Lanark and learning more about Owen's vision. I also appreciated the walk up the Clyde River to the very scenic Falls of Clyde. 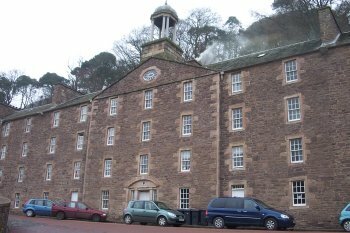 Logistics: New Lanark is easiest to reach by automobile, and is only a short drive away from both Glasgow and Edinburgh. A mixture of work and the chance to see my cousin DJ in Glasgow gave me an opportunity to open my WHS account for 2013. A great weekend mixed with lowered expectations actually made this a rather rewarding visit. Having looked at maps before my visit I had always seen the town’s layout as a little odd, but upon reaching the crest of the valley in which it sits it all suddenly made sense. It is actually quite a picturesque setting, sitting as it does in a valley carved out by the Clyde. The river forms Britain’s largest waterfalls just downstream from the town and at this point the water is fast flowing which was the key factor in the building of the mill here. Several people I had spoken to in Glasgow before my visit had all visited New Lanark on school trips as kids and (like Els and Kyle) I did feel that the majority of the visiting experience was aimed at the local school children. Having said that the ‘futuristic hanging fairground ride’ was fairly engaging and did decent job of introducing basic concepts about life in the Mill. It can be rather tough to find uses for these large ex industrial buildings and presence of an ‘Edinburgh Woollen Mill’ outlet showed that it was a challenge that had not been tackled too well here. A visit to the former school was reasonably interesting, though I would say it would perhaps be best to skip the well-intentioned but rather twee video there unless you have some kids in tow. I also enjoyed the recent addition of the lottery funded roof garden, replete with labyrinth ending on a World Heritage Symbol. A visit to Robert Owen's house actually provided the one bit of interpretation that was aimed at a more adult audience and one that I found rather interesting. 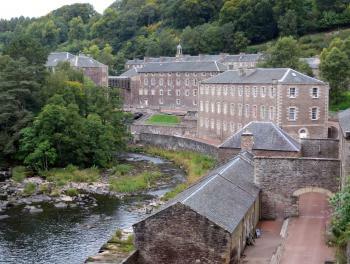 It showed how New Lanark was used as a test bed for Owen's ideas of a more balanced and caring form of capitalism. It was different to the moral and religious paternalism on show at Saltaire and has actually had a longer lasting effect. Developments here lay the foundations for and supported such concepts as trade unions, the co-operative movement, reform socialism and the welfare state, things that are still relevant/ omnipresent in modern European states and have effects around the world. The fact that the mill was highly profitable was used as an illustration that these weren't just Utopian dreams but actually practical ways of improving people's lives. I visited New Lanark after a weekend in Glasgow which turned out to be a rather pleasant surprise. I thought it was a rather impressive city, with much to recommend it even in relation to its more illustrious neighbour Edinburgh. And as ever Christer (below) is right to recommend spending a wee bit of time exploring its pubs and bars, or if that doesn't take your fancy then it has a fine array of museums and galleries to keep you entertained as well as the works of its architectural superstar Charles Rennie Mackintosh. I rather enjoyed this little weekend trip, and New Lanark is a rather interesting site which has a relevance and influence on many aspects of modern life. Somewhat of a strange site, though interesting. Clearly important in relation to Owens Socialist ideas and philosophy concerning Industrial Britain. New Lanark needs a little sprucing up in its tourism appeal. It is indeed a fascinating site, located in a beautiful location in southern Scotland, but it does lack a coherent adult message. New Lanark tourism is somewhat strange in its attempt to entertain children, yet during the tour I felt amongst the tacky aspects it lacked a clear message on the importance of New Lanark and what Owens was really trying to create. After having visited the Giants Causeway on Northern Ireland I continued down to Belfast to catch the fast-ferry over to Scotland. I apologise sincerely to all Belfastians but I was not very impressed by the city so I decided to wait for my boat in the harbour for a couple of hours. This was certainly not the most exquisite area of the town but when standing there, I found myself overlooking a shipyard on the other side of the harbour, a wharf named Harland & Wolff and suddenly I realised that this was the site where once the magnificent Titanic was built, back in 1911-12…wow, historic grounds…! the worlds largest catamaran, a 160 meter long ship with a top speed of over 40 knots that would have envied the 1911 shipbuilders in Harland & Wolff if they would have had the opportunity to experience this amazing ship of the 21st century. New Lanark is an hour’s train ride south of Glasgow and you can very conveniently buy a travel package at the central train station, including the train fare, the connecting bus and the entrance fee to the visitors centre at New Lanark. The site itself is beautifully located in a lush valley on the outskirts of the village Lanark and it’s not a coincidence that the Scotsman David Dale, decided to found his cotton mill right by the river Clyde back in 1784. This turned out to be the perfect location for his future venture. It is obviously Robert Owen - the Socialist - who makes New Lanark as famous as it is. 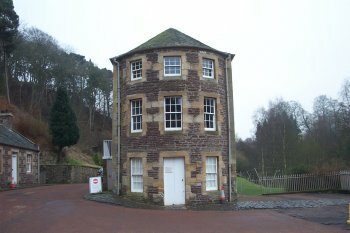 Being the second owner of New Lanark in the early 19th century, it provided him with a platform for experimenting with his socialistic ideas. The workers was given reasonable wages, health-care and a basic educational system was provided for the children - things that we take for granted today but was quite a scandal within the industrial community of England of it’s time. New Lanark can be summarised as an interesting site with a good piece of industrial as well as political history attached. Please take the opportunity to visit the site if you travel to Glasgow and after a nice day in the pleasant neighbourhood of the cotton-mill, why not go for a cold pint in one of the many pubs and bars in Glasgow…..I did! "until an overall view of the sites where social doctrines of the contemporary world evolved in connection with the industrial or agricultural revolutions had been realized and a comparative study on the industrial sites of 19th C had been carried out by ICOMOS"